Hillary Clinton has spent decades pounding the podium on behalf of children. Now the Washington Post’s Wonkblog has asked her and other notable figures to share their favorite graphs of the year and explain why they chose them. Clinton’s choice highlights the power of adult interactions with children. Why ask for a favorite graph? Wonkblog essentially says it’s joining the crowd: “Time has its ‘Person of the Year.’ Amazon has its books of the year. Pretty Much Amazing has its mixtapes of the year.” For Wonkblog, the subject is graphs that illustrate important issues in public policy. “We want to help all parents give their kids a good start in school and in life. That’s what this graph is all about,” Clinton writes. The former first lady and former secretary of state is focusing on closing this “word gap” through an initiative called Too Small to Fail. The graph comes from a report called “The Youngest Americans: A Statistical Portrait of Infants and Toddlers in the United States” that was released by the Robert F. McCormick Foundation and the nonprofit organization Child Trends. Perhaps Hillary Clinton’s favorite graph of 2013 will help policy wonks, civic leaders and the general public to better understand some basic facts that the early childhood policy community has known for some time. 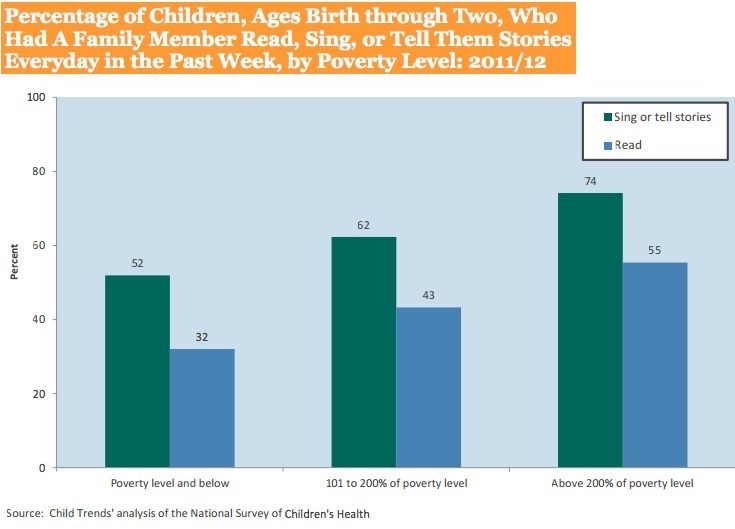 Data visualizations like this one can inspire action and change that help children, families and communities close the early literacy gap. Know someone who would be surprised or shocked by the information in this graph? Share this post with that person and keep the conversation going. Eye on Early Education focuses on the twin goals of ensuring that Massachusetts children have access to high-quality early education and become proficient readers by the end of third grade. Alyssa Haywoode comes to Eye on Early Education after a career in journalism that included writing editorials for the Des Moines Register and Boston Globe. She has written about education, human services, immigration, homelessness, philanthropy and the arts. MA Department of Early Education and Care licensed family child care, center-based and school-age programs. National Association for the Education of Young Children accredited centers and preschools. Contact your local school department about public pre-k and kindergarten programs.